I have had good luck with all her recipes. Chocolate chippers, lemon bars, madeleines, brownies, shortbread, thumbprints, rugelach, biscotti, mandelbrot, and fortune cookies--we all love them. We love them even better when they are home-baked. The ultimate comfort food, fresh-baked cookies offer instant reassurance, consolation, and community. One of the reasons we hesitate to bake cookies is that all too frequently we discover that we donÃ‚Â¹t have all the ingredients we need (or we donÃ‚Â¹t have enough time to bake them from scratch). Cookie Dough Delights conveniently solves both problems. 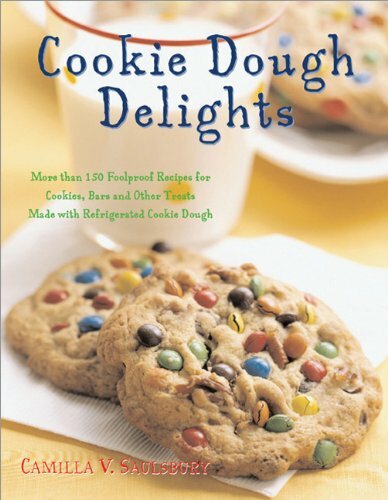 Its easy recipes will tempt everyone back to the oven with an assortment of delectable home-baked cookies (and a smattering of other mouth-watering desserts), all of which begin with an 18-ounce roll of refrigerated cookie dough from the supermarket dairy case. With little more than a few easy, simple steps, the ordinary can be transformed into the extraordinary. Using refrigerated cookie dough is not about abandoning traditional cookie and dessert recipes; it is a celebration of the options available to bakers today. The ease of working with refrigerated cookie dough also helps bakers of all abilities to focus on the aesthetics of cookies and desserts"Â¹including fancy decorations and icings"Â¹if they so choose. Recipes include drop cookies, formed and fancy-shaped cookies, bar cookies, filled cookies, special treats, icings, frostings, fillings, and other extras.